Categorizing Temporary Exhibits is a bit tricky! There are so many exhibitions by so many organizations at so many different locations that its difficult to keep abreast of them. Even more challenging to categorize them. However over the years, I have documented many temporary exhibitions! Here is an attempt to present them in a somewhat categorized fashion. Some of organizations enter into partnership, so there are significant overlapping. For example, “Art in Action” is partnership between CPD and DCASE, whereas “In/Situ Outside” is partnership between EXPO Chicago, CPD and DCASE. Also at the very onset, I would clarify that I document only of the exhibitions I have personally seen. The images have been taken by me. Rotating Temporary Exhibits: Some organizations present recurring Temporary Exhibits, usually on a specific location. Like in the Millennium Park, the Boeing Galleries are venues for a series of rotating exhibitions Contemporary Art by living artists. 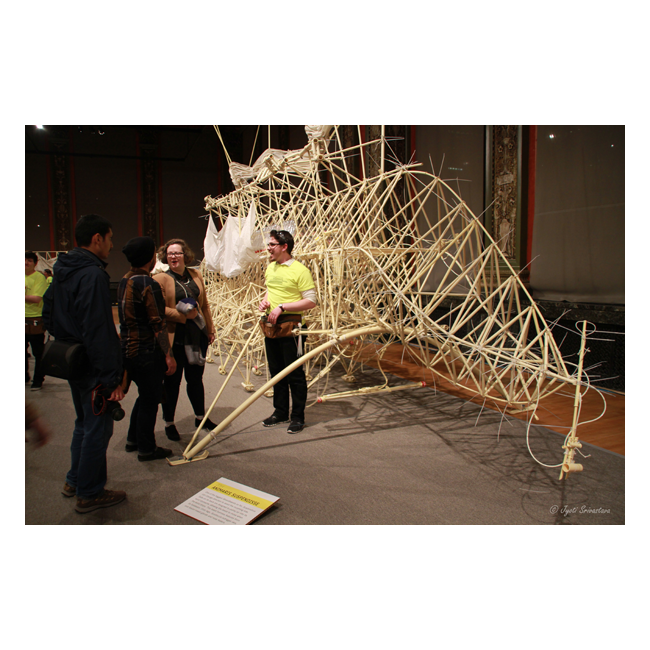 The Chicago Loop Alliance organizes Temporary Exhibits in the Chicago Loop area. Museum of Contemporary Art [MCA] has large scale rotating exhibition in MCA plaza. Random Temporary Exhibits: There are also some Special Exhibitions, which happen once in a while and we never hear about it again. Like in 2015, we have “Statue Stories Chicago”, in 2014 we had “Horses of Honor and in 2013 we had: “Borders” in Solti Garden [Grant Park], “Great Great Chicago Fire Hydrants” at various locations, and “Giant Head Planters” at Chicago Cultural Mile. These are just a few examples. have been venue for series of rotating exhibitions of world-class Contemporary Art by living artists. Millennium Park Temporary Exhibits.. click here..
Pioneer Court is private property and Zeller Realty Group controls exhibits at Pioneer Court. Pioneer Court Temporary Exhibits. click here..
CDP Temporary Exhibits.. click here..
DEPARTMENT of CULTURAL AFFAIRS & SPECIAL EVENTS [DCASE]. DCASE Temporary Exhibits. click here..
Partnership of CPD and DCASE..
InSitu Outside/ Partnership of Expo Chicago, CPD & DCASE.. click here..
Chicago Loop Alliance has been organizing Temporary Exhibits in the Loop..
Chicago Loop Alliance.. click here..
Museum of Contemporary Art [MCA]. by contemporary artist at the MCA Plaza. MCA Plaza Project.. click here..
the group has organized multiple Temporary exhibits in different locations of the city. The Nathan Manilow Sculpture Park started it’s Solo Exhibition Series in 2009. The exhibition brings exceptional artwork by nationally and internationally recognized artists to the park. Nathan Manilow Sculpture Park click here..
ART INSTITUTE of CHICAGO .. click here.. THE CLIFF DWELLERS ..click here..
Blog Temporary Exhibits: click here..